The beauty of the ceviche is that the fish is marinated in lime juice and in this process, the fish flavor becomes fantastic . In this occasion instead of using fish , we are going to use shrimps but they are also marinated in lime and the flavor that they acquire is unique . The ceviche also consists of mixing many ingredients and here the same rule is followed. In this ceviche you will see tomato, avocado, cucumber and more ingredients that give lots of freshness and harmony to the ceviche. In few words you will have a type of very interesting salad on your table, that you have taste. – In Mexico the shrimp ceviche is normally served as entree plate although it can also be enjoyed as main course accompanied of a red rice. And don’t forget to put tortilla chips or crackers garnishing the plate. Making ceviche is easy, only the shrimps have to be marinated and then many ingredients are mixed. This ceviche is prepared with raw shrimps, therefore you will have to buy the freshest shrimps that you can find. Don’t worry you won’t eat raw shrimps they are cooked with lime. If peeled and deveined shrimps are bought, you will save some steps. We recommend preparing this ceviche with red onion because it has a more special flavor than the one of the white onion. The total preparation time is of 1 hour . Dice the shrimps with the ones you worked. Then pass them to a food container. The juice of 10 Limes. Cover the food container, put it in the fridge and leave the shrimps marinating for 45 minutes, so the flavors mix. Cut into small chunks the cucumber with the one you worked, put it in a bowl and reserve. Dice 1 avocado and 2 tomatoes; transfer these ingredients to the bowl and reserve. Finely chop 1/2 red onion, 1 serrano pepper and 4 coriander sprigs; upon completion pass them to the bowl and reserve. Take from the fridge the food container. Transfer from the food container to the bowl the shrimps that were marinated, without adding all the lime juice just a small quantity. You will notice that the shrimps had a transparent appearance and through the lime cooking they have turned into a white and pink color. Also add in the bowl pepper to taste. Mix very well the shrimp ceviche with the mixing spatula. Put in the fridge the bowl and leave the shrimp ceviche resting for 10 minutes, so it will be fresher and the flavors mix. 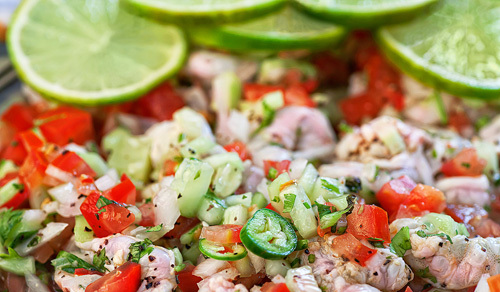 * Ketchup or a salsa can also be put to this ceviche. Tip: In Mexico it is accustom to serve he ceviche in conical glass cups. If you have some available use them – the ceviche will look precious. Variation: Prepare a meatless ceviche – vegetarian ceviche. Did you like the Ceviche? - After eating fish you may feel thirsty, then prepare a Mexican Drink. - To close this meal a Mexican Dessert. - Check what do you want tomorrow for Breakfast. In this recipe you have to chop many ingredients and you will need a good knife like the Victorinox. With so many limes that you are going to squeeze, you will definitely need a lime squeezer with a good grip like the OXO. Know with precision the weight of your ingredients so your recipe will come out perfect with the “Kitchen Scale EatSmart".